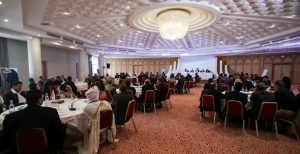 In what is being seen as an historic event, almost all Libya’s mayors taken part for the first in a forum on the numerous challenges they face and declared that they will work together to end the crisis in the country. Mayors and representatives from almost all the existing 94 municipal and six remaining local councils took part in the three-day forum ending yesterday, held in the Tunisian resort of Hammamet and organised by the Geneva-based Centre for Humanitarian Dialogue (HD). With over 90 mayors attending, there has been no such gathering before. It included not only elected mayors but also those in the east of the country who had been appointed by Major-General Abdul Razzaq to replace those who had been elected. “It shows that we can sit down and work together,” said one western region mayor. 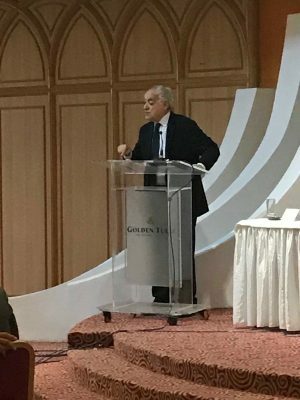 “Historic” was the description of UN special envoy Ghassan Salamé, who addressed the event, saying that the UN had duty to support and work with local government. Preparations to convince all the mayors and other officials of the importance of such a gathering had taken over six months, an HD official said, and had had to be discreet. “That is why they succeeded,” he explained. The various authorities in the east and the west had given their blessing to the meeting with a single proviso, he added, that there be no attacks at the event against officials, ministers, leaders or anyone else. That condition had been scrupulously adhered to during the forum, he said. The mayors concentrated on the problems of delivering local services and running their municipalities, as well as people’s declining living conditions and the need to ensure that the tens of thousands of displaced people can return home. They also noted that their legitimacy was accepted throughout the country and that as “one voice emanating from the depths of Libya”, they would do their utmost to help the country out of its mess. “We are determined to exert our full national role in bringing Libya out of the situation of division and disintegration and in pushing for the earliest possible solution to alleviate the suffering of the Libyans”, a statement from them read. “We look forward to overcoming the transitional stages and incomplete legislations by hastening the organisation of parliamentary elections,” they added. They also insisted that decentralisation had to be the basis for the administration and distribution of basic public services, calling for the implementation of the 2012 local government law in its entirety, but also amending it in order to enhance the role of local government. This was a reference to the fact that many local services, such as refuse collection and street cleaning, currently are not under the municipalities’ control. They furthermore said that they should be part of any international initiatives aimed finding a solution to the crisis. The lack of money was one of the main areas of discussion and consensus. Funding for 2017 and 2018 had to be a “top priority” for the central authorities, they insisted. Moreover, in future, the transfer of their budgets had to be on fixed dates. They had to be no delays, they declared. Additionally, the central authorities had to provide the municipalities and local councils with additional financial resources in cases of emergency. As for the amounts, they had to be based on various criteria, such as population, size of area, distance from basic facilities and degree of inequality in economic development and infrastructure. Regarding any taxes that required to be collected locally, the mayors said that should be allowed to take off any amounts due to the municipalities before remitting them to the central authorities. They also want municipalities to have a greater role in local security and in combatting crime in their areas. Currently policing is the exclusive affair of the interior ministry. One other demand was that in order to ensure that there was continuity of service locally and no vacuum between current local administrations and new ones at the time of the next round of municipal elections, these should take place ahead of end of the present councils’ term of office. Because of divisions among councillors, some councils were left in limbo, without an elected mayor and administration, for months after the municipal council election. The mayors also said that they wanted their next meeting to be “on Libyan soil”.